By now you should have a clear understanding of います and あります however there is one problem with all of this, we don’t know how to disagree with someone or to state that they are wrong. We can easily do this just by changing tenses. はじめましょう! Remember the copula です? It can be viewed as “to be” but as we know from English grammar, “to be” is a verb which can only mean that です is both a copula and a verb. For example, if you’ve BEEN somewhere or perhaps you’re about to be in a location. Verbs are actions and they have tenses even in Japanese. 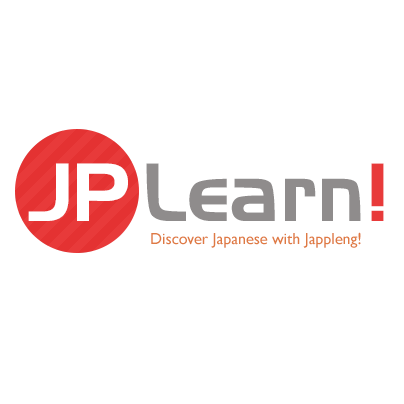 In Japanese, verbs are easy to learn how to conjugate and we will learn more about them in JPLearn! Lesson 21 however, we will advance one step at a time by first observing the Present-Positive and Present-Negative (Polite) tenses. If we take a look at the chart above, we can observe and find that です (to-be) can become ではありません when it is conjugated negatively. Let’s first look at an example for further elaboration. In the above example we added the word “No” いいえ to the beginning of the sentence to declare the argument and conjugated です to で　は　ありません. It may seem strange that we are using ありません when there is a living thing (the cat) in context but in this context we should be using ありません because it just is. When you must state that something is not, use ではありません. When you must state that that such thing is not there, you may use いません. In other verb, ありません is the negative of “to have / to be” and is a conjugation of the verb ある. The verb いません is the negative of “to be” meaning the existence of something and it is a conjugation of the verb いる. Perhaps by now the usage of the two has become more evident. There will be more practice in the assignments and in future lessons you will become more natural with the correct grammar through more exposure. Truth be told, you will not use ではありません　too often because it’s strictly very formal and unnatural in day-to-day conversations. While it may still be acceptable it can be seen as the difference between using the full meaning and instead using an apostrophe like “will not” and “won’t” in English. It is certainly more polite to say ではありません though it may not sound natural in context. Keep in mind that you should retain a Formal conversation approach to those whom rank higher than you in society such as your boss, a police officer, customers and so forth. Let’s observe the following table to see the key differences between formalities. Well done, let's finish the conversation between ひでよ and ひとみ from the previous lesson. It’s now time to do this lesson’s assignments. We will be using a chart to create our own sentences, learn new katakana characters, and improve our vocabulary. In the next lesson, we will be learning about Japanese Adjectives. This will be a 3-part series as it is quite an extensive subject. However after learning Japanese adjectives we will be able to put all of what we learned into practical Japanese.